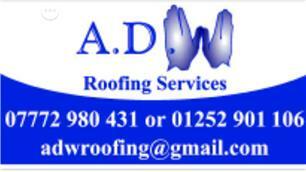 ADW Roofing Services - Fascia/Soffits/Guttering, Roofer based in Wellesley, Hampshire. Welcome to my Checkatrade page and thank you for taking the time to look into my details. I have been in the roofing trade for over 25 years. ADW Roofing Services specialise in EPDM Rubber & High Performance Flat roofing and tiling. Replace your old flat roof with EPDM Firestone rubber and get 20% off replacement UPVC fascia and free guttering to compliment your flat roof . I pride myself in offering a prompt, efficient service and I am conscious of my customer’s needs, ensuring all work carried out is completed to the highest standard and being fully guaranteed. I am pleased to offer free, no obligation estimates, and where possible match any competitive quote. Please feel free to contact myself to discuss your individual needs and requirements, I am always happy to help.